Article 166 of the Constitution of the Republic of Bulgaria states that the flag of the Republic of Bulgaria is a tricolor: white, green, and red from the top, placed horizontally. According to the Bulgarian State Seal and National Flag Act, the three color fields shall be identical in form and size: Form - rectangular with a 3:5 width-to-length ratio. Size: 18 cm x 30 cm, 24 cm x 40 cm, 90 cm x 150 cm, 129 cm x 215 cm. Colors: white - with a degree of whiteness not less than 80%, green - #17-5936 TS according to the Pantone-textile scale, and red - #18-1664 TS according to the Pantone-textile scale. Standard samples of the colors of the national flag shall be kept by the Committee of Standards and Metrology. "On the eve of 1 November, the Day of the national enlighteners, president Georgi Parvanov bestowed on every Bulgarian town-hall the national flag, accompanied by a personal message from him, informed the president's press service. In his message Georgi Parvanov calls for the Bulgarian flag to be waved in every municipality with purity and immaculateness as a symbol of the statehood and the dignity of the Bulgarian people. “On 1 November we pay respect to all Bulgarian patriots, who devoted themselves to revival and development of our country. This is a celebration of Bulgarian national spirit and self-confidence”, reminds in his message the president. The municipalities that receive the flag these days are 3 742. This is a third successive initiative of Georgi Parvanov in the framework of the initiated by him campaign for raising the national flag at important public buildings. Under the patronage of the president, on 1 November 2004 the national flag was raised in every Bulgarian school. The next year started the annual ritual of raising the flag in front of the parade entrance of the president's institution." The coat-of-arms of the Republic of Bulgaria is a state symbol of the independence and sovereignty of the Bulgarian people and the state. (1) The coat of arms of the Republic of Bulgaria is a golden crowned lion, standing on his hind legs, in front of a dark red shield. The shield has a crown, whose prototypes are the crowns of Bulgarian rulers from the Second Bulgarian State, with five crosses and another cross above the crown. Two golden crowned lions, standing on their hind leg, facing the shield, hold it. They stand on two crossed oak branches with acorns. Under the shield there is a white band with the flag that reads: “Union Makes Strength”. (2) The graphical and colour image of the coat-of-arms, established by the appendix, are part of this law. (1) The coat-of-arms of the Republic of Bulgaria is on the state seal, as established by the State Seal Law. (2) The coat-of-arms of the Republic of Bulgaria, placed elsewhere as well as the reproduction of the elements of the coat-of-arms on badges, commemoration medals and others is allowed only under an ordinance of the Council of Ministers. The first Bulgarian Constitution (adopted on 16 April, 1879) says in its 23rd article: "The Bulgarian national flag is of three colors, and contain <consists?> of horizontally placed white, green and red colors". The second Bulgarian Constitution (adopted on 6 December, 1947) says in its 97th article: "The flag of the People's Republic of Bulgaria is of three colors - white, green, red, placed horizontally. In the left upper corner over the white strip is placed the coat of arms of the People's Republic. The third Bulgarian Constitution (valid since 18 May, 1971) states in its 141st article: "The flag of the People's Republic of Bulgaria contains three colors, placed horizontally in the following order from up to down: white, green and red. In the left upper corner over the white strip is placed the coat of arms of the People's Republic." This text was changed on 27 November, 1990, the new text ("The flag of the Republic of Bulgaria contains three colors, placed horizontally in the following order from up to down: white, green and red.") was valid until the adoption of the fourth, actual Bulgarian Constitution (since July 13, 1991). According to Fischer Weltalmanach '99, Russia, at the beginning of the 19th Century the only independent Slavic state, was the example for all Slavic states under Ottoman Turk and Austrian-Hungarian rule. These would be would be Serbia, Slovenia, Slovakia, Czech Republic, and Bulgaria. In the Bulgarian flag, the blue stripe was replaced by the freedom color of green. The flags in green, white and red colours were used by Bulgarian Legia (revolutionary organisation founded in Serbia by Bulgarian emigrants led by G. Rakovsky) in 1861-1862. The first white-green-red striped flag was made by S. Paraskevov and presented to Russian-Bulgarian troops (during the war against Turkey) in the Romanian town of Braila in 1877. It was a swallow-tailed banner. There was a lion and inscription "BULGARIA" in the centre (in Cyrillic characters). Now, the "banner of Braila" is kept in the War Museum in Sofia. The Bulgarian Constitution of 1878 confirmed this flag (but rectangular and without a lion). Each year since the fall of the communist government, a ceremony is conducted in Sofia, where the bishop sprinkles holy water on a symbolic horse's tail and a flag from the Russo-Turkish war. The flag and horse's tail are provided by the Museum of Military History. The celebration occurs on January 6, a religious festival day in Bulgaria. In addition, the bishop throws a silver cross into a river or lake, from which it is retrieved by a devout believer. As far as I am aware, there is no "state flag" prescribed nor used (i.e., the national tricolour with the coat of arms in the upper stripe). The closest thing to it is the Prime Minister's flag, but with the white stripe double the width. It may be that the former custom of having the coat of arms in the canton induced some to produce and use such a flag by ignorance or eagerness, but I would be surprised if such flags would indeed be used on the state institutions. If it exists, it would look like this (drawn by Mihail Shcherbak). Yesterday, there was a memorial service for the victims of the recent terror attack in Bulgaria. 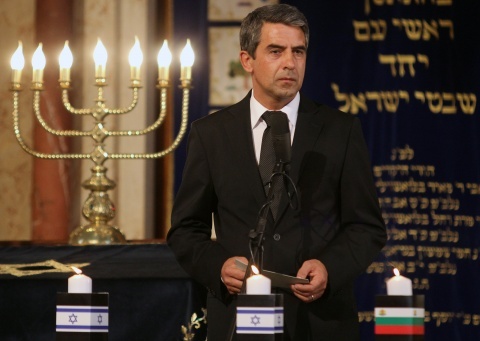 Some candles had small Israeli flags around their holders, but at least one had small Bulgarian flags. There is clearly a symbol on the upper stripe (see image), at the hoist, but the picture to too small to make out what it might be. The symbol, even it is small, looks to me clearly like the actual Bulgarian coat of arms: http://en.wikipedia.org/wiki/Coat_of_arms_of_Bulgaria. Even though not official, it is quiet often seen practice to add a coat of arms to a flag. There is an unofficial version of the Bulgarian flag that is extremely popular, but has zero official status - http://dariknews.bg/uploads/news_images/201306/photo_verybig_1107050.jpg. It features the full coat of arms on the left of the flag, but across the white and green fields only. I think it became popular because people were used to having the arms at the top-left during communist times, and so they started making this flag, but with a larger arms because it is more colourful.